Ah, winter. It's the time of year all cyclists love to hate. For certain parts of the country, wide open roads are replaced with snowy conditions and freezing temperatures, leaving cyclists trapped indoors for their workouts. This is a blessing and a curse. For one, the winter offseason gives your body a chance to recover and rebuild after a long year of hard training and racing. But on the other hand, it also inherently makes you feel less productive and like you're losing all that hard-earned fitness. 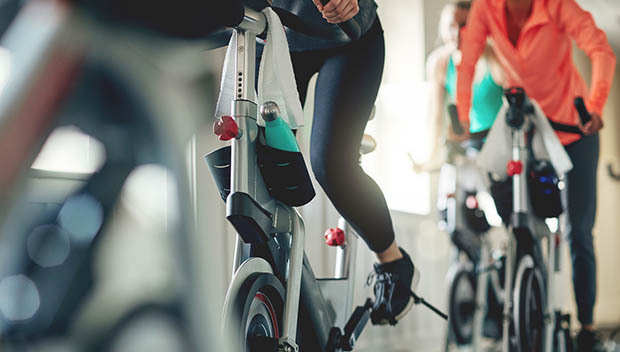 While nothing can replicate the feeling of riding in the great outdoors, indoor cycling workouts are an effective way to maintain your fitness during the offseason. From classic structured training plans to more immersive virtual experiences, we've gathered seven step-by-step indoor cycling workouts produced by a variety of channels to get you through winter and beyond. If you think suffering can only happen on a Thursday night group ride, think again. The Sufferfest offers over 50 expert-curated workouts through nine different categories—from base training through speed building and everything in between. Watch real professional cycling footage from the Tour de France and Giro d'Italia as you progress through the warm up, main set and cool down of each workout. Simply connect your sensors to the app, and you're ready to suffer. Learn more about The Sufferfest and try it free for seven days here. Time is of the essence when it comes to indoor training. Fortunately, it is convenient, accessible and highly effective—even with shorter training efforts. These three indoor cycling workouts by TrainingPeaks are all under one hour and include over/under, power and speed intervals. Designed to mimic the demands and accelerations during group rides, these engaging indoor workouts will have you primed and ready for the upcoming season. Learn more about TrainingPeaks and its indoor training workouts for cyclists here. Gone are the days when you had to stare thoughtlessly at the wall as you worked through a hard indoor stationary trainer session thanks to new advancements in technology have allowed for a more engaging and interactive experience. Zwift is leading the way in this regard, offering an immersive platform where you can not only use prescribed workouts by elite World Tour coaches but also race and interact with cyclists from across the globe. Simply pair your sensors (or trainer) to the app for one of the most realistic indoor experiences possible. Learn more about Zwift and try its workouts free for seven days here. Anaerobic threshold and VO2 max are just as important as power and endurance when it comes to cycling, and the offseason is the perfect time to refine these less-emphasized aspects. Call us biased, but we especially like these boredom-busting indoor cycling workouts. From threshold intervals to high cadence spinning, these four workouts will keep your trainer spins fresh while working on valuable skills in the process. Throw it back old school—these workouts require no additional gear or apps other than a stationary trainer or rollers. Check out more of ACTIVE's indoor cycling workouts and cycling-related articles here.